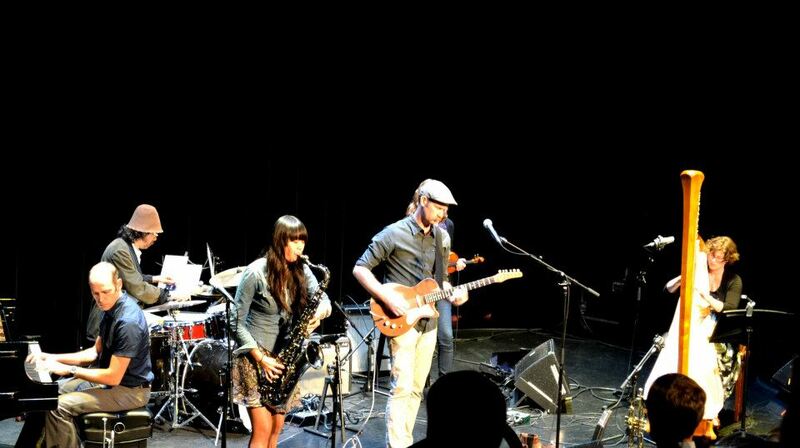 The 19th annual Guelph Jazz Festival was another resounding success. 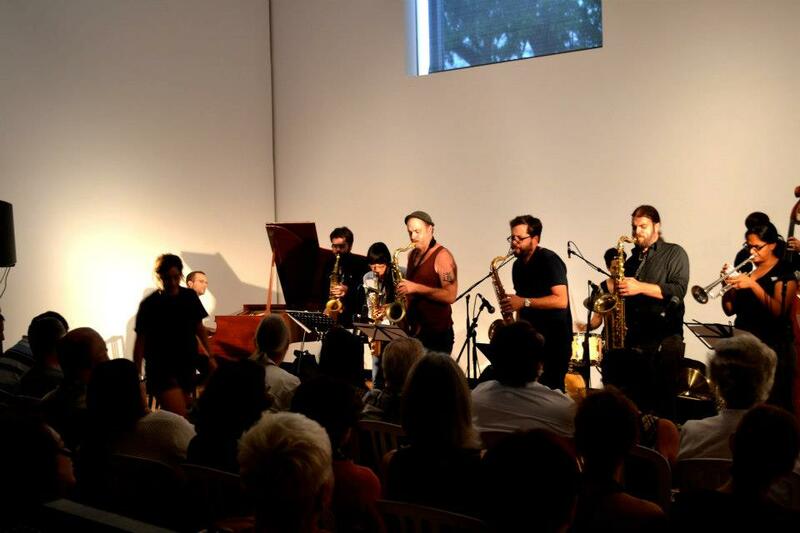 This year’s festival showcased an array of innovative accomplishments in jazz and creative improvised music from around the world. The onstage interview and rare appearance by the legendary South African pianist Abdullah Ibrahim (formerly known as Dollar Brand) was one of the many highlights. Despite the challenge of sporadic rain, the Wyndham Street Jazz Tent’s relocation to Market Square in front of City Hall worked out great. Yes, it truly was another exciting festival with something for everyone, from a stimulating colloquium, which included electrifying workshops and intellectually invigorating talks, to the many musical performances around town, to what has become one of the premiere Nuit Blanche events in North America (at least in this writer's humble opinion). Here are a couple photos captured through the amateurish lens of PhD student, and Guelph Jazz Festival Board Member, Paul Watkins. 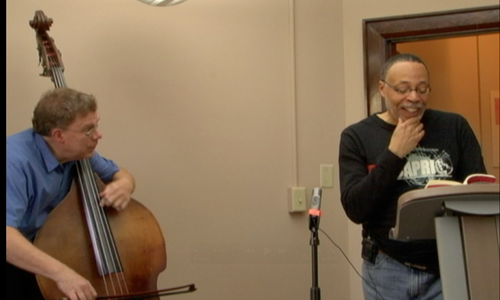 Rob Wallace and Joe Sorbara (with Alan Stanbridge) lead a John Stevens Improvisation workshop. Ajay Heble speaking at the Festival Launch. 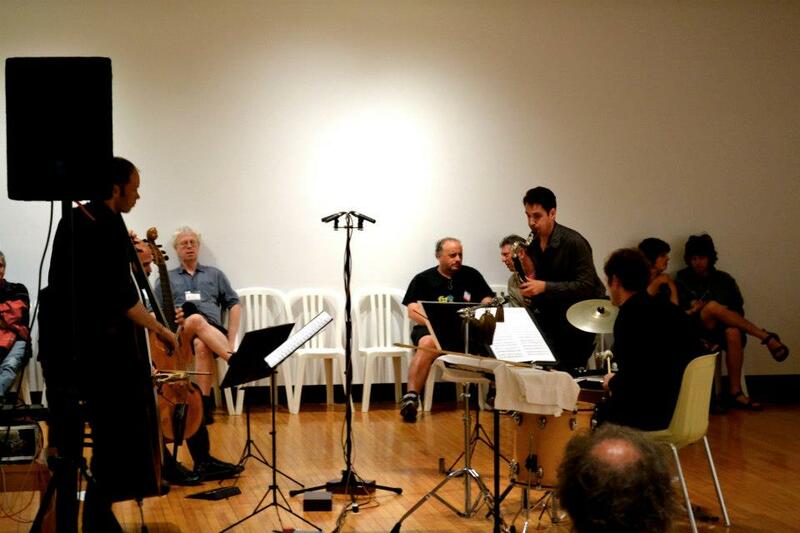 Coltrane's Ascension: Jeremy Strachan and Ensemble. 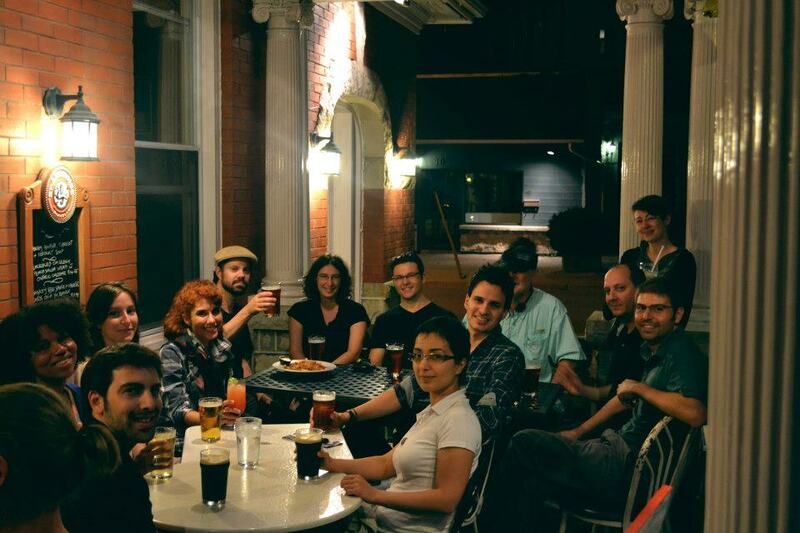 Summer Institute people and colloquium speakers enjoying a beer. 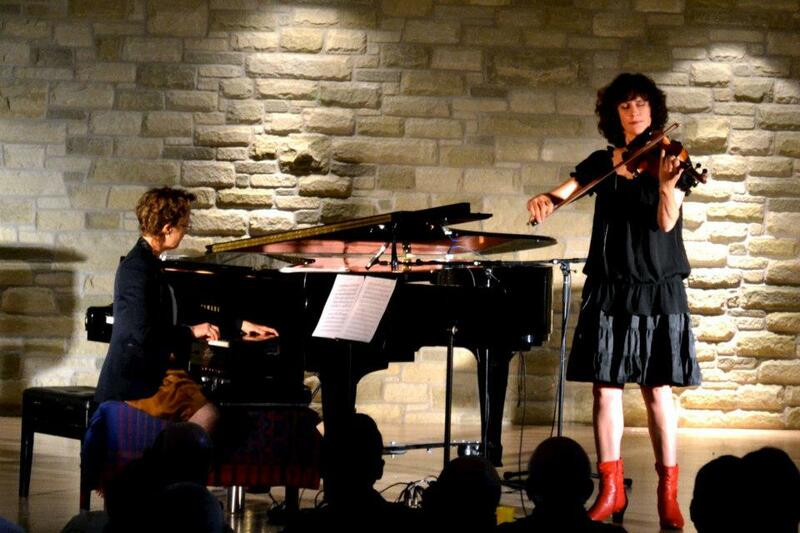 Jenny Scheinman & Myra Melford. Darius Jones and Matthew Shipp. KidsAbility Youth Parade before the Abdullah Ibrahim show. 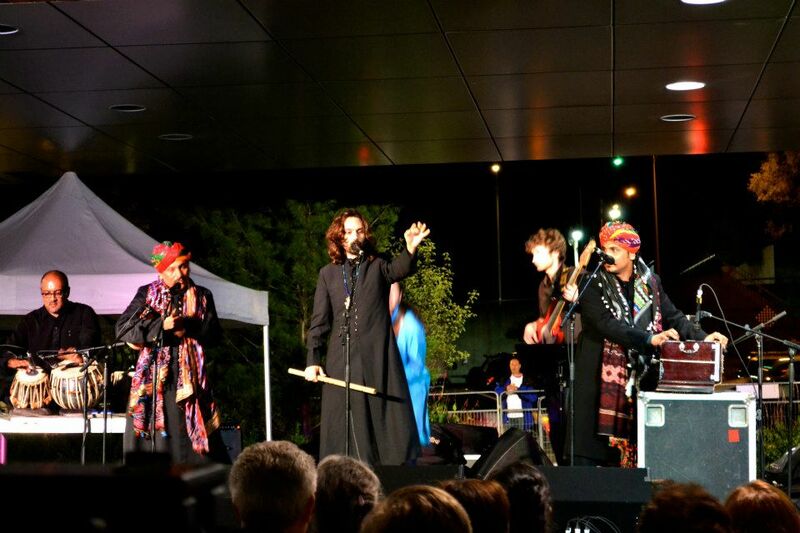 Anthemusa performs in Old Quebec Street. 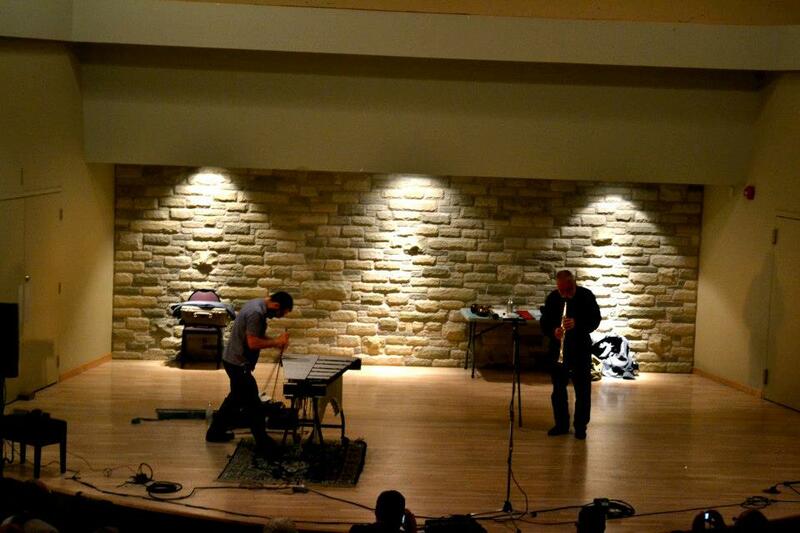 German saxophone ‘firebrand' Peter Brötzmann and vibraphonist Jason Adasiewicz. 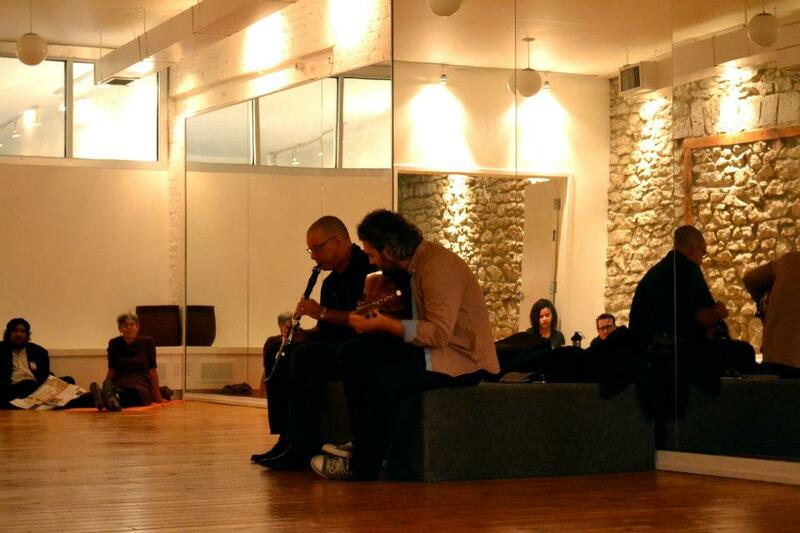 Clarinetist François Houle's solo Nuit Blanche performance. Here he is accompanied by Gordon Grdina between their two sets. 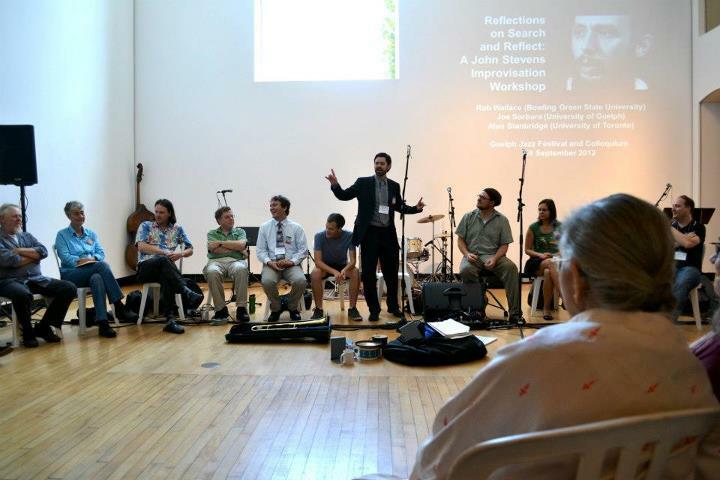 Quartetski pays homage to American composer John Cage at MSAC between 3:00-4:00 am. Charles Spearin's The Happiness Project closes the festival. Missed the fun? 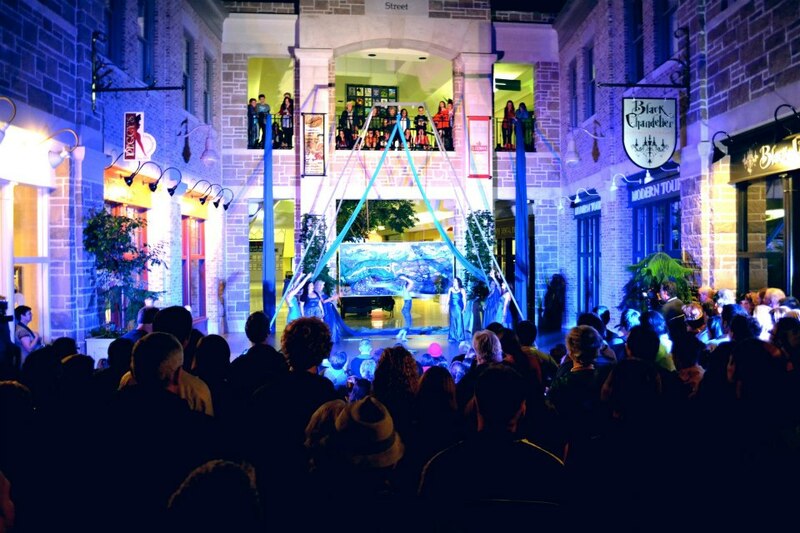 Make sure you catch next year's festivities! 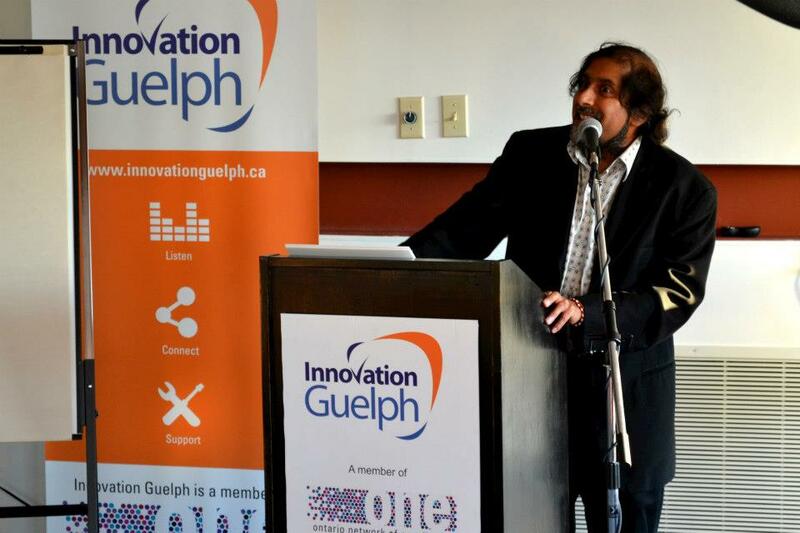 Next year the Guelph Jazz Festival turns 20! "Your bass sounds like a typewriter": A Reading and Interview with George Elliott Clarke. Accompanied by bassist, David Lee. George Elliott Clarke is one of Canada’s most prolific poets. He is also a renowned essayist, scholar, playwright, and, in many ways, a songwriter. This month’s Oral History—co-sponsored with the TransCanada Institute and SETS (The School of English and Theatre Studies)—proudly presents George Elliott Clarke for an interview, preceded first with Clarke reading from his latest collection of poetry, Red. On some of the poems, Clarke is accompanied by bassist and ICASP Graduate Fellow, David Lee, for an in the moment improvised performance. Following the reading is an interview with Clarke conducted by PhD student and ICASP researcher Paul Watkins and Postdoctoral Fellow Katherine McLeod of the TransCanada Institute. In the interview Clarke converses about his musical and literary influences, from the Romantics through to the Beat Movement and into African Canadian poetics. Further, Clarke discusses how he crafts his own creative poetic voice and practice in relation to a variety of artist-intellectuals across borders. 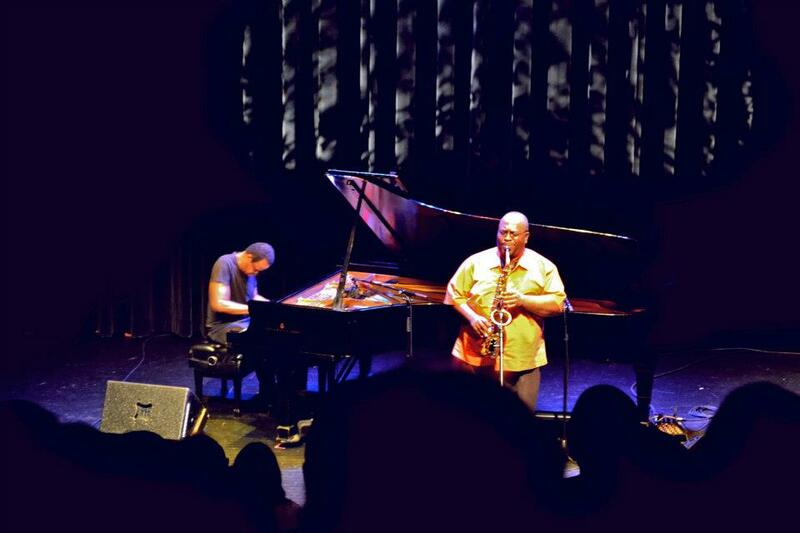 Watkins and McLeod engage Clarke in critical inquiry about the nature of improvisation and music relative to his work, with a particular focus on the jazz opera, Québécité, produced and performed at the 2003 Guelph Jazz Festival. The interview is far reaching and engages in a series of cosmopolitan, multicultural, and polyphonic critical explorations that explore the role of popular song, dedication and inspiration, as well as poetic sensibility in relation to modernism and postmodernism, with a focus on the place of rhyme in poïesis. And, there is also a good measure of self-reflexive excursuses throughout the interview from the poet himself. You can also find a review by Paul Watkins of Clarke’s latest book of poetry, Red, here. We have to start thinking about planetary citizenship. Not just national. 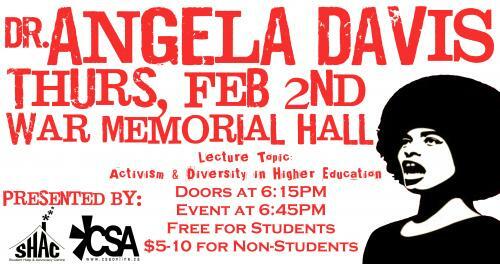 -Angela Davis in Guelph, February 2nd, 2012. Angela Davis (born January 26, 1944) is an American political activist, scholar, and author. Davis emerged as a nationally prominent activist and radical in the 1960s, as a leader of the Communist Party (USA) and Black Panther Party, and through her association with the Civil Rights Movement. Prisoner rights have been among her continuing interests; she is the founder of “Critical Resistance,” an organization working to abolish the prison-industrial complex. Photo taken by Paul Watkins. 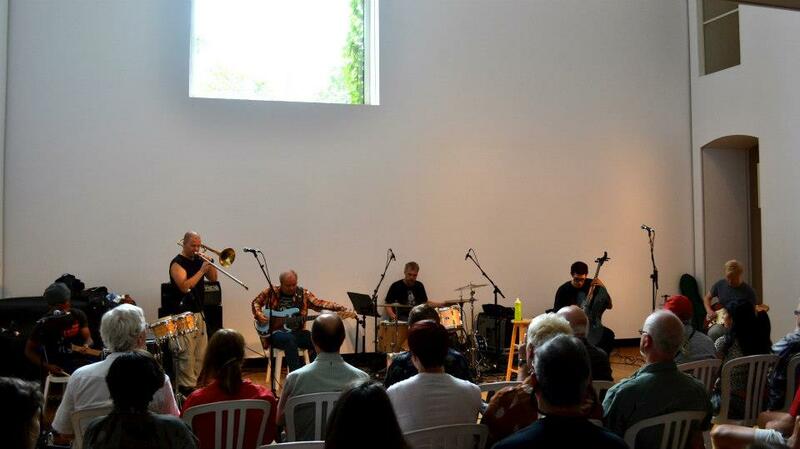 Stetson performing during a workshop at this year's Guelph Jazz Festival Colloquium. Colin Stetson (Quebec) born in Ann Arbor, Michigan and currently based in Montreal, Quebec, is a bass saxophone player and touring member of Arcade Fire, Bell Orchestre and Bon Iver. 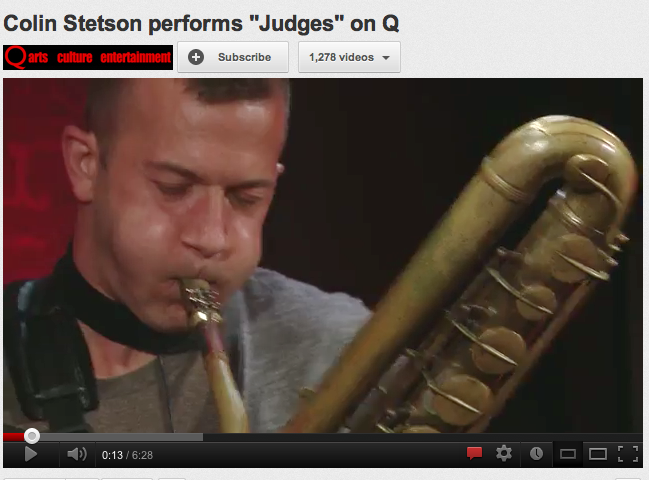 In addition to saxophone, he plays clarinet, bass clarinet, french horn, flute, and cornet. 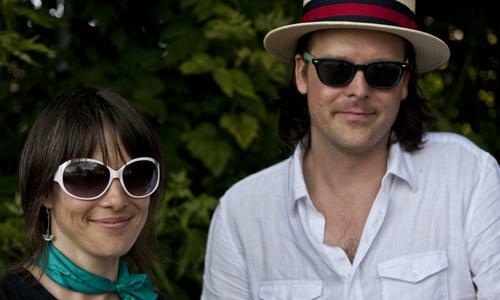 Stetson has performed and recorded with dozens of other artists, some including Tom Waits, TV on the Radio, Feist, My Brightest Diamond, Laurie Anderson, David Byrne, Jolie Holland, Sinéad O'Connor, LCD Soundsystem, The National, Godspeed You! 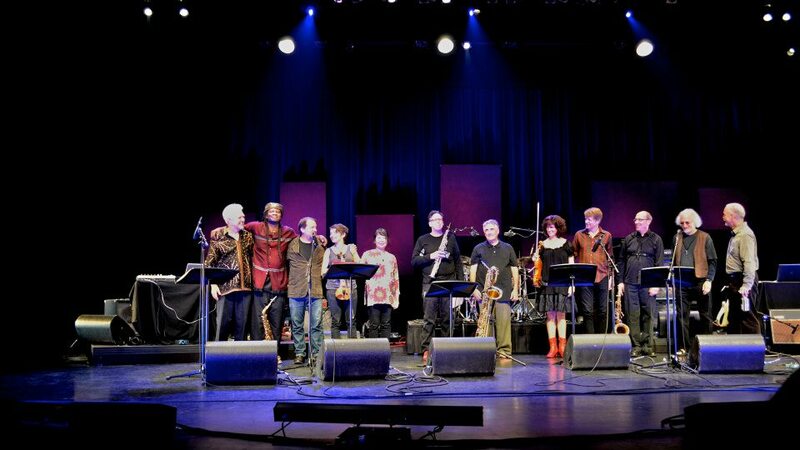 Black Emperor, Angelique Kidjo, Kevin Devine, Beanie Burnett, and Anthony Braxton. Stetson has carved out a niche that crosses the lines that separate listening publics. 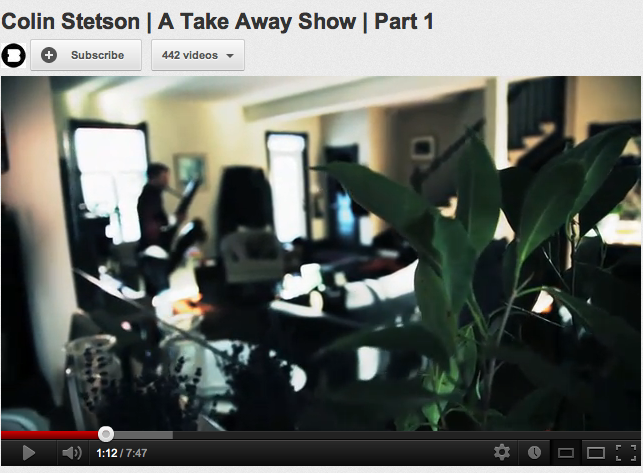 Focusing primarily on solo saxophone performance, in particular on the seldom-heard bass saxophone, Stetson is as readily identified with the pop music scene that coheres around the record label, Constellation, as he is with his forbearers in the avant-garde solo saxophone tradition: Anthony Braxton, Evan Parker, John Butcher, and many more. This remarkable phenomenon is, in part, to do with the songlike structures that Stetson plays; stereotypically ‘experimental' effects like circular breathing and controlled overtones are used in the service of material derived, in essence, from popular music. And Stetson delivers this material with precision, conviction, and considerable force. 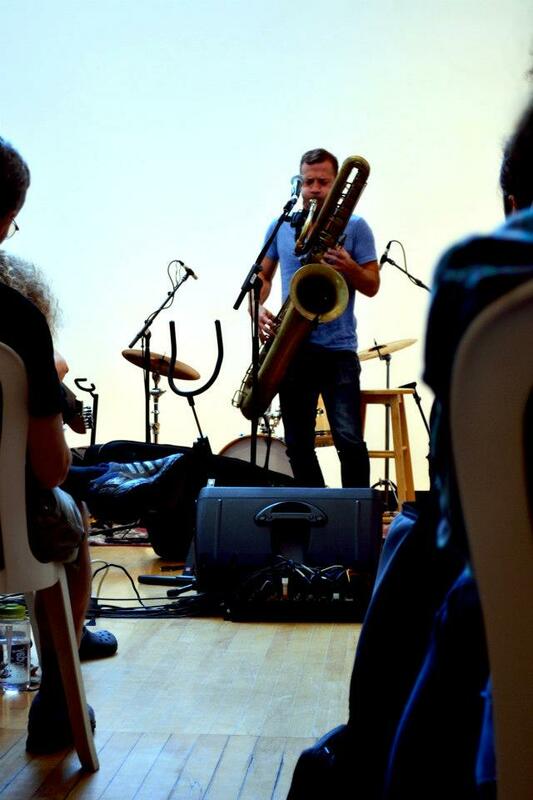 Colin Stetson performed at this year’s Guelph Jazz Festival in a double bill at St. George’s Anglican Church (in the Sanctuary) with Guelph’s own Ben Grossman. In collaboration with local professional-calibre musicians, we would like to work with intergenerational groups to develop the content for a dynamic, family-oriented outdoor event that celebrates the sharing of ideas and creativity across generations. 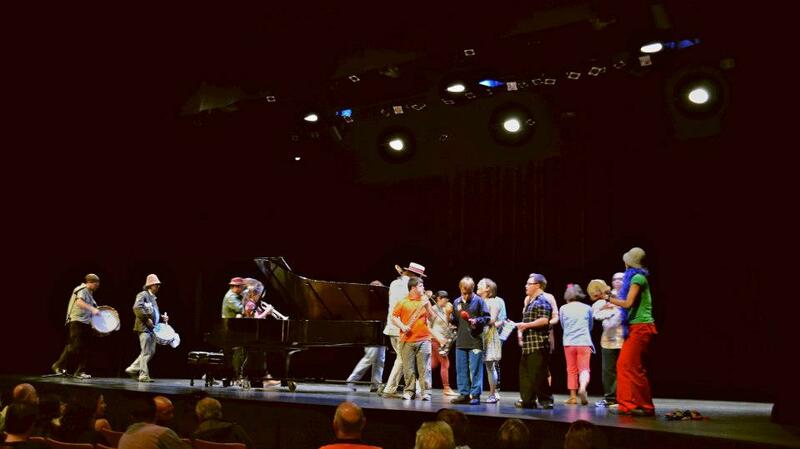 The model that we have in mind is grandparents making music with grandchildren, but we invite any interested 'grandparent-age' people, regardless of experience, to be involved, to work with children whom they know or with whom we can pair them. The idea is to share each other’s songs – an adult with one or two children, for instance, though other formations are possible. During an informal meeting (60-90 minutes), with a professional musician as a facilitator, the children will teach adults the songs that they like to sing. Likewise, adults will teach the children songs that they like to sing. If energy, motivation, and time allow, we can write a new song together. After a second meeting, enough songs will have been learned (or written) to have around 5-8 minutes of repertoire. Then, on October 13th (rain date on October 20th), the various groups will be set-up under or next to particular trees in the park, where, at staggered and overlapping start-times, they will casually perform their repertoire of songs. The audience – family, friends, neighbours, others – with the map-based event-program in hand will wander through the park to get little glimpses of each group. The presentation will be casual, the 'performance pressure' will be low, and fun will be the main goal. Other intergenerational groups will work in a dance vein – with Susanna (who is principally a dance artist) and Guelph-based dance professionals – on the porches of homes surrounding the park. The event will last around two hours, though individual contributions will be quite short. We are actively seeking participants for this project. Enthusiasm and open-mindedness are far more vital than musical experience or skill. Kindly contact us if you would like to be involved in this special event, or would like to recommend someone whom you think we should contact directly about their involvement. For those more interested in dance and creative movement than in music, there is room for you too. Expressions of interest in as well as questions about this project can be sent to Mari Biehn, Project Assistant (biehnm@uoguelph.ca; 519.824.4120 x53958). We are looking forward to working with you and your friends. Thinking Spaces: The Improvisation Reading Group and Speaker series runs a reading group session during the academic year every two weeks (currently Fridays 3-5 pm). The Improvisation Reading Group and Speaker Series considers the ways in which improvisation can provide us with new ways of thinking and acting. Readings may include music, performance, film, academic texts, fiction, etc., based around critical thinking on improvisation.Throughout the year, this group also organizes public talks and workshops. Each reading group focuses on a particular reading circulated in advance, and may also include short informal presentations by current ICASP students, artists or community groups. This group is coordinated by the current ICASP postdoctoral research fellow at the University of Guelph. The group meets at a central location, currently the Guelph Public Library. This group is open to all—community members, faculty, and students. We welcome new participants at any time throughout the year. Please contact improv@uoguelph.ca or 519-824-4120 x53885 for more information or to be added to our mailing list.See below for information on the past readings and past events. The group also organizes social occasions following the reading group sessions and speaker events. Upcoming reading group dates for 2012: September 28th, October 12, October 26th, November 9th, November 23rd, and December 7th. PhD student and ICASP graduate Videographer/Researcher Nick Murphy (Loess) took first prize in the Toronto Urban Film Festival, for his short film "24Progressive."